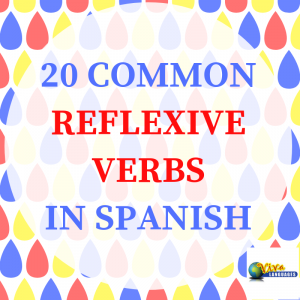 Reflexive verbs in Spanish often cause learners a real headache because they are so different to how we use the same verbs in English and because they can completely change the meaning of the verb when used with a reflexive pronoun. For example, ‘ir’ means ‘to go’ whereas ‘irse’ means ‘to leave / go away’. The best way to get your head around Spanish reflexive verbs is to stick with the ones you will need to use most. When are reflexive verbs used? Reflexive verbs occur when the subject and the object are the same in a sentence. For example, when you wash yourself, when you look at yourself in the mirror, when you put clothing on yourself. However, there are also verbs that just happen to be reflexive which has nothing to do with the subject and the object of the sentence. Examples of these verbs include: quejarse = ‘to complain’ and atreverse = ‘to dare to’. What are the reflexive pronouns? 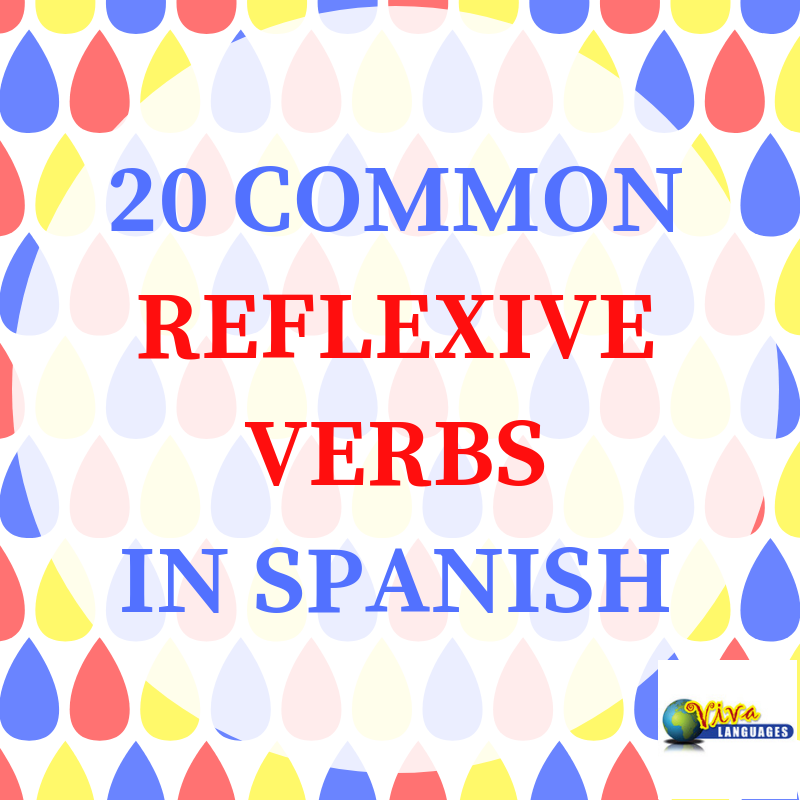 Which are the most common reflexive verbs to learn? How do you use reflexive verbs? The best way to learn how to use these reflexive verbs is to try to make up your own sentences and use them with a native speaker when you get the opportunity. No me acuerdo de donde dejé mi libro. – I don’t remember where I left my book. Or you could just say, ¿Te acuerdas? – Do you remember? Me voy de vacaciones el jueves. – I’m going on holiday on Thursday. Se casaron el año pasado. – They got married last year. Me siento enfermo. – I feel ill.
Me pongo un abrigo porque hace frío. – I’m putting my coat on because it’s cold. Quiero hacerme abogado. – I want to become a lawyer. No me atrevo preguntarle. – I don’t dare to ask him/her. ¿Te atreves a pedirle más dinero? – Do you dare to ask him/her for more money? Se ve en el espejo cada mañana. – He looks at himself in the mirror every morning. Me veo en una situación imposible – I see myself in an impossible situation. Me encontré con un problema grave. – I found myself with a serious problem. Vamos a quedarnos en un hotel. – We are going to stay in a hotel. Me quedé en casa anoche. – I stayed at home last night. Quiero sentarme – I want to sit down. Me levanto a las seis de la mañana. – I get up at six in the morning. ¿A qué hora te levantas? – What time do you get up? You use this in the sense of finding out new information. Me enteré de los resultados ayer. – I found out the results yesterday. Acabo de enterarme que conseguí el trabajo. – I have just found out that I got the job. Me pregunto si venderé mi casa pronto – I wonder if I will see my house quickly. Se preguntaba donde puso su cartera – He was wondering where he put his wallet. Me llamo Ana – I am called Ana. Nos reunimos una vez al mes. – We meet up once a month. This is followed by “por” to say to work “about” something. ¿Por qué te preocupas tanto? – Why are you worrying so much? ¡No te preocupes! – Don’t worry! Me digo que puedo hacerlo. – I tell myself that I can do it. ¿Por qué te dices eso? – Why do you tell yourself that? This is to tell people what you dedicate yourself to. Often it is to talk about your profession. ¿A qué te dedicas? – What do you dedicate yourself to? Me dedico a un curso de español. – I dedicate myself to a Spanish course. Me fijo en los precios de los vuelos porque en este momento son baratos. I am concentrating on prices of flights because they are cheap at the moment. ¿Te has fijado en la hora? Es muy tarde. – Have you noticed the time? It’s very late. If any of the above verbs are new, try out some example sentences and try to use them with a Spanish friend, relative or colleague. This way you will learn how to use them as well as memorise them more easily.